Seasoned ethnomusicologist Bruno Nettl famously titled a chapter in his concept/method book, “Come Back Tomorrow.” Days like the one I had yesterday in Nakifuma remind me why, despite distractions, frustrations, and roadblocks, I keep doing exactly that. Having already reunited with my dear friend Ssematimba, yesterday was to be a work day for us wherein we could talk through some of the issues and opportunities presented by the possibility of archiving some of his recordings. Given his generous nature and our good relationship in the past, I fully anticipated that he would be cooperative. The response I got yesterday went well beyond cooperation, though. Not only did he gather most of the people involved in those recordings at his office in Nakifuma, he also set up my explanation of this work in ideal fashion. Once I explained to people how much I wanted them to have access–here in Uganda–to their own recordings, they practically threw a party! Not only did they respond favorably to archiving old materials, they also insisted that I record new songs. We began yesterday, but they want me to come for an event this coming weekend and videotape it. This rather business-like matter out of the way, it was very important to this group that I hang around and socialize with them. I spent a good deal of time with many of these folks in 2010, and we were all happy to be back together for a relaxing afternoon. 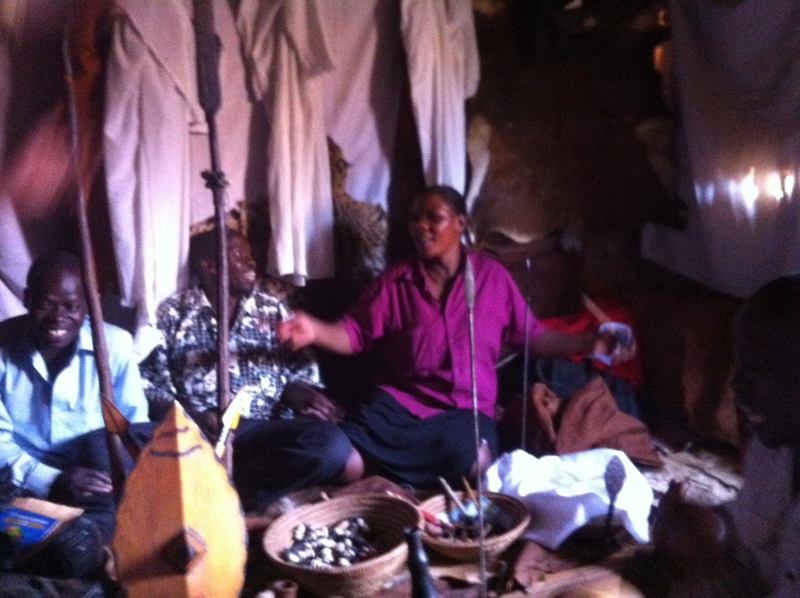 From Ssema’s place, we went to Jjajja Bbali’s compound, a place that has many shrines for different Kiganda spirits. Between these two locations, some in the group introduced me to new spouses, others to new children, and all to new friends. I have spent more time than I care to admit trying to capture the essence of convivial interactions that make ritual events so inviting for spirits in my writing. What struck me about yesterday was that this jovial atmosphere is not part of some rarefied break from everyday banalities. It is a cornerstone of daily living, something people actively pursue and often achieve in the company of family and close friends. One can never capture these moments, of course: they are as fleeting as this blurry image. Oh, who am I kidding? I’ll be glad when my nicer camera is fixed. That’s John Kyobinga on the left, Mwalimu Ssenogga in the middle, and his wife Nakayima on the right.